These documents are in Adobe Portable Document Format (PDF). You will need Adobe Acrobat to read them. If you do not have it, you can download the reader for free from the www.adobe.com web site. We have chosen to provide this technical resource to the internet community because we believe in the, perhaps, old fashion concept of service. Many of the items available here are educational for the end user, and others, such as the jumper settings, are on older units which, although still in the field, do not get much support from the OEM. Thus, we try to fill this information gap to assist the end user get the maximum performance out of their units. We constantly get e-mail messages from users thanking us for making this information available, and stating that they have not been able to find it anywhere else. According to our web logs, we have a number of field service companies who routinely access these documents. What is tape head reconditioning? - 45K - PDF. An introduction to QIC tape drive technology- 18K - PDF. An introduction to Helical Scan (8mm and 4mm DAT) tape drive technology - 12K - PDF. Helical Scan (8mm and 4mm) Drive Preventative Maintenance - 20K - PDF. Helical Scan Head Wheels, They Are Repairable - 36K - PDF. The benefits of degaussing tapes instead of using software erase or overwrting them - 13K - PDF. An introduction to CD-ROM technology - 16K - PDF. Instructions on the proper removal of the 8mm upper drum assembly - 44K - PDF. Introduction to and Instructions for the use of Magnetic Developer - does not use ozone depleteing CFCs - 5K - PDF. Adaptec AVA-1505 - 80K - jpg. Adaptec AHA-1520A/1522A - 180K - jpg. Adaptec AHA-1540CF/1542CF - 118K - jpg. Always IN-2000 - 67K - zipped file. Wangtek QIC 36 interface controllers: PC-36i controller; PC-36ii controller; PC-36iii controller - each about 79K - jpg graphic format. 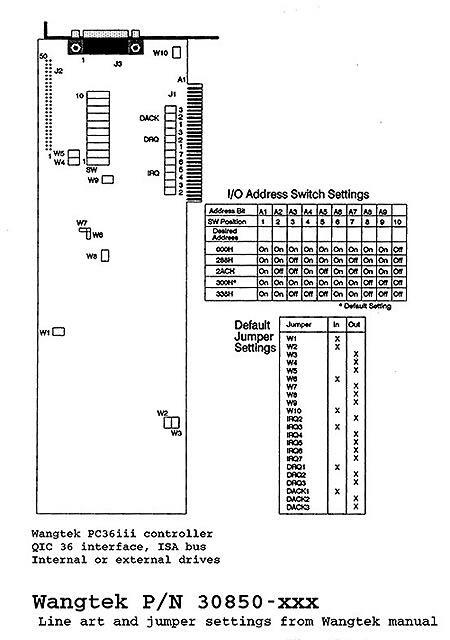 Wangtek QIC 02 interface controllers: PC-02i controller; PC-02ii controller - each about 79K - jpg graphic file. Archive 2525S QIC tape drive - jpg file format - 79k. Wangtek 5099/5125/5150 QIC SCSI tape drives - jpg file format - 72k. Wangtek 5525ES QIC tape drive - jpg file format - 53k. Archive/Conner 4520NT - DDS-1 DAT drives - gif graphic file - 21K. Hewlett Packard 35470/35480 DAT drives - gif graphic format - 32K. WangDat 1300 series and 2000 series DAT drives - jpg file format - 81K. WangDat 3100/3200 DAT drives - gif graphic format - 14K. WandDat 3300DX/3400DX DAT drives - jpg file format - 85K. Wangtek 6130/6200 DAT drives - jpg file format - 78k. Exabyte 8200 series 8mm tape drives - jpg file format - 66K. Exabyte 8500 series 8mm tape drives - jpg file format - 34K. If there is other information you would like to receive, or if you have a question, or are willing to submit a paper for inclusion in this library, Gary Moore, General Mgr., can be reached via e-mail to smigm@sprague-magnetics.com.